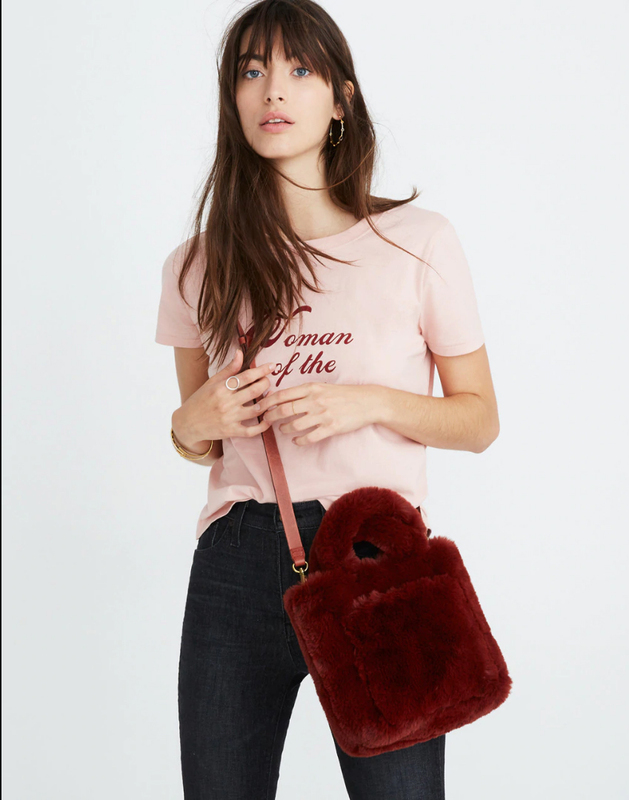 This post about picks for the Madewell 2018 Black Friday promo and more contains affiliate links. Please read this blog’s disclosure post for more info. Anyway Madewell is not going to miss out on your Black Friday dollars! No. During their Black Friday event you can take 25% off your Madewell purchase. Use code DEALWITHIT. 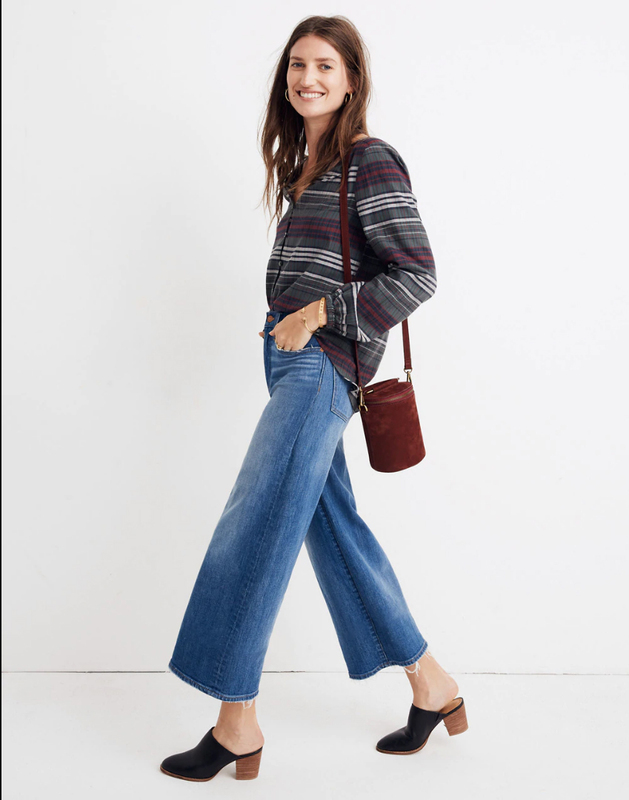 And you guys, Madewell’s new Holiday 2018 collection is awesome! I’m love with so dang much of it!!! So we’ll take a deeper dive into Madewell’s goodies first and then at the end of this post I have a roundup of Black Friday deals that have already launched. I’ll be looking at two related questions for each promo: is it worth it? Should you buy now or wait for a better deal? In Madewell’s case the answer is very much yes it’s worth it to shop now! In mid-December we’ll very likely get a tiered promo with the top % being 30% off. However, a lot of Madewell’s best items will sell out before then! What should you buy at Madewell right now? Oh, everything. I’m hardly exaggerating!! After a lackluster Fall 2018 collection, they’ve unleashed so many goodies on us at once! The Leopard Dot Pullover Sweater (now $66) topping the post is the minimalist’s leopard. It’s so cute on and goes with everything. Wear it over a dress, or with a skirt, or with pants, joggers, leggings, whatever! The sweater is on my must-have list. Their jean collection is also suddenly chock full of must-haves. The High-Rise Slim Boyjean in Lita Wash: Step-Hem Edition (now $102, above)? Perfection on us talls. The Rivet & Thread Straight Jeans in Buckthorn: Selvedge Edition (now $171), seen in the last photo of this post and normally excluded from promos? Included this go-round, and amazing on! Hanukkah starts early this year (December 2, 2018) and I’m so happy it does! I’m expecting gift cards and I’ve specifically requested Madewell gift cards. In the meantime, I’m apt to dive in for my most-desired pieces now and pieces that are likely to sell out. Velvet or silk, for instance? 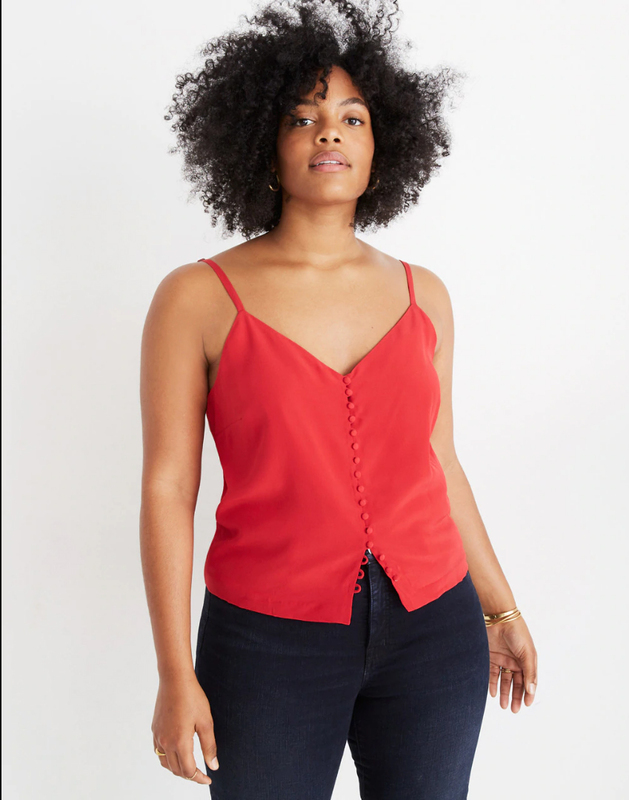 With the Velvet Button-Down Cami (now $45) and the Silk Button-Down Cami (now $59) I don’t have to decide. I can get both to satisfy different cravings! These are the kind of no-decision decisions I face currently. My life as an influencer affords me many extra chances to grow my closet (or my temporary styling closet thanks to brand lend-outs!). Do you think Madewell would mind if I just asked to borrow one of everything in my size? Then again, maybe I’m better off buying to secure a permanent spot in my closet. I’ve been thinking about investing in a pair of white boots for instance. 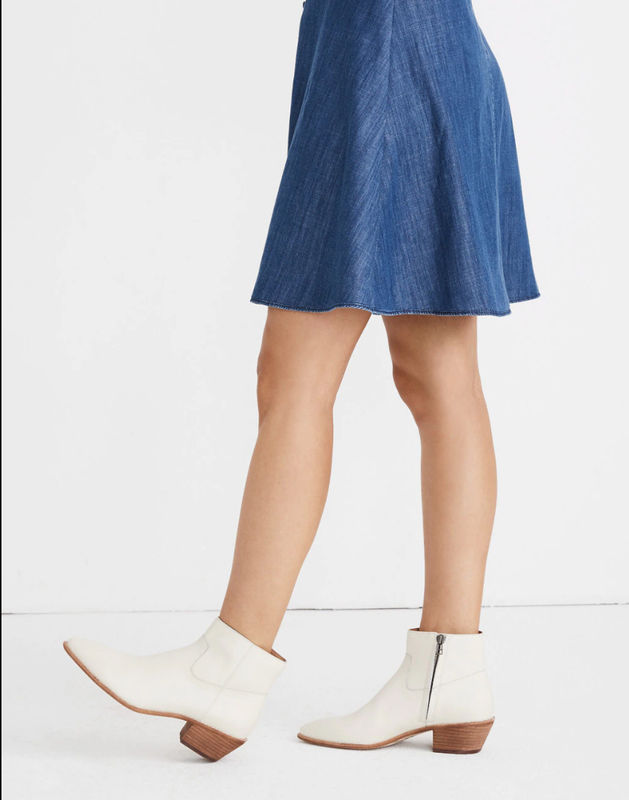 But I think I like Madewell’s off-white versions even more than a chalky bright white option. The Ramsey Chelsea Boot in Leather (now $158, above) is a great approximation of a much more expensive designer brand’s boot. These are in my cart right now and I think I’m taking the plunge. In addition to wearing them with the Tulip-Sleeve Maxi Dress in Antique Flora (now $75) as seen above, Madewell has some other really pretty dresses the boots would coordinate with too. I’m hoping to hunt down the Lilyblossom Button-Front Dress in Blooming Oasis (now $104, seen further down in this post) in my size as it’s nearly sold out online. You’ll see the top version on my Instagram tonight! I’m also quite taken by the Skyscraper Sweater-Dress (now $89) which has nearly sold through too. And so my journey through Madewell today is one of delight and overwhelming desire to buy so much. Luckily, gift-giving mode is also in full swing. That will hold me in abeyance from overspending on myself — a silly thing to do anyway. Madewell’s Gift Guide is full of curiosities, beauty delights and items sure to make people smile. Today as the Madewell 2018 Black Friday promo kicks off you can find gifts that can be personalized, gifts under $25 (or under $75, or under $100). You can even peruse the gifts everyone is getting for someone. Maybe like me you’ll find some things to give, and some things to deservedly give yourself! If you need size guidance or advice on what to get a particular friend or family member from Madewell, I’m here to help! As you’re shopping the Madewell 2018 Black Friday promo (or any promo) if you feel stuck, I find it helpful to ask myself what I’d like to receive. If someone got this item or that item for me would I feel delighted? This is my guidance as I gift shop. Below, more Black Friday promotions that have started early, and then, shop all my Madewell picks for the Madewell 2018 Black Friday promo!! Happy Early Black Friday hunting!!! This post will be updated as more promos are unveiled, and there will be a fresh Black Friday post on Friday too. AERIE | Aerie is 40% off! Get Free Shipping on your order too. No code required; discount reflects in checkout. | Is it worth it? Possibly not, prices very well may improve before Christmas. | Picks: Aerie has the prettiest bralettes around, in a diverse set of sizes. Check out my favorites in this post. AMERICAN EAGLE OUTFITTERS | Take 40% off your AE purchase. Flannels are $25. Aerie is also 40% off! Get Free Shipping on your order too. No code required; discount reflects in checkout. | Is it worth it? Yes, prices won’t get better til after Christmas. | Picks: AE’s selection can be overwhelming. I help you narrow down the choices here. ANTHROPOLOGIE ADDED 11/22 | Take 30% off everything. | Is it worth it? Yes. We won’t see a deeper full-price promo. | Picks: The Bias Satin Skirt (now $83) is so surprisingly flattering on! I have it in pink and will probably get the grey too. If you want to splurge this cami gets my vote. So many more picks in this post! BANANA REPUBLIC UPDATED 11/22 | Beat the holiday rush with 50% off your purchase. Cardholders get an extra 10% off. | Is it worth it? This is a much better promo than the week started with, and there are no exclusions!! Hooray!! But off course now things are flying off the website. | Picks: I own and love the Aire Turtleneck Sweater ($90) and the Pleated Tulle Midi Skirt (see it on me on my Shoppable outfits page). To see more picks, check this post out. BHLDN ADDED 11/22 | There are new markdowns in BHLDN sale! | IS IT WORTH IT? It’s very likely that there will be an extra % off sale in the near future, so you may want to hold off unless something you want is about to sell out. | Picks: Even if you’re not planning a wedding right now as I am, there are still beautiful jewelry, shoes and party dresses to choose from. I tried on the Lure of Lace Gown (now $1,200) and it’s one of the only BHLDN gowns I liked on. It’s lovely, but not my wedding dress. I can tell you that I did get jewelry for myself and my bridesmaids at BHLDN! (One peek: these earrings, not on sale.) How gorgeous are these sale heels? (Tempted, I haven’t picked my wedding shoes yet.) And OMG, this dress! Or this one. Or this one. OK, I need to stop before I blow my whole 2018 gift budget, lol. BODEN | Boden misses us! (They tell me by email all the time.) Take 30% off your Boden order and get free shipping/returns on orders of $49+. | Is it worth it? Yes, prices won’t get better til this stuff hits sale. | Picks: I adore this skirt; 30% off makes me want to splurge on this dress; how cute are these heels? Are these heels maybe even a bit cuter?? DSW ADDED 11/22 | Get 20% off with code MADHOUSE. | IS IT WORTH IT? Honestly this is pretty meh, I was expecting 30% off! So perhaps not. I have a feeling a buy more/save more promo is coming soon. | Picks: I find Jessica Simpson’s pumps to be ultra comfy! They are all-day wearable for me. I just bought the Carpena (now $56) in leopard a few weeks ago and they’re great; I also have the Levin (now $48) in white. DSW is also my main source of Adidas shoes; their Courtset (on me 1, 2) is one step down from the Gazelle but actually fits me better. EXPRESS | Take 50% off (nearly) everything. Plus, get Free Shipping on every order. No code required; discount reflects in checkout. | Is it worth it? Yes, prices won’t get better til this stuff hits sale. | Picks: Express is a great place to consider buying your New Year’s Eve outfit!! This dress is very likely my NYE dress, unless the night is freezing. I’ve got plenty of picks in this recent post. FREE PEOPLE UPDATED 11/22 | Take 50% off 50 luxe essentials in the Black Friday pre-sale. FP Movement items are 20% off. I’m also noticing select bags are showing up as 50% off in my cart. No code required; discount reflects in checkout. | Is it worth it? If you want one of these items yes! | Picks: I own and love both the Ela 2 Layer Necklace and the Rae Necklace; either of these would make lovely gifts! The Temecula Maxi Dress is also included in this promo in one color. It’s worth noting that this dress is poorly-rated by the community because of a tight lining; it may be worth a shot at 50% off? Else, there’s lots of crazy expensive stuff in the promo. Just for fun, below are some more picks. HUNTER ADDED 11/22 | Take 30% off select items and 20% off other select items. Prices as marked. | Is it worth it? If the color/style you want is only available on Hunter’s site, then yes. Otherwise no, you can likely find better deals on Hunter boots elsewhere. (I check Nordstrom Rack often.) | Picks: I did end up taking the plunge on the Original Short Boot (now $112) from Hunter’s site to secure my top color/size preference. These just barely make it over my calves. I also love the beautiful Dark Slate Tall Boot (now $120), alas these do not fit over my calves. If you’re looking for a good gift idea from Hunter, their boot socks are amazing. J. CREW | Take 40% off your purchase with code TOGETHER. | Is it worth it? Debatable. I like a lot of J. Crew’s newest pieces, but I have a feeling a better promo is coming. | Picks: I’m wearing this dress in black to our office Christmas party (with a cardi over it); I think this tartan dress is adorable; you see these d’orsay heels on me all the time, this bag is a fantastic way to try a trend without dipping in too deeply. LOFT UPDATED 11/22| Take 50% off your purchase. Use code THANKS. | Is it worth it? I was sure this 50% off was coming! And yes, now it’s worth it. | Picks: I’m wearing this necklace constantly; more LOFT picks in this recent post. LUCKYBRAND ADDED 11/22 | Take 50% off everything. Sale is an extra 60% off. | Is it worth it? If you like Lucky Brand, totally! | Picks: I do love so much at Lucky Brand! I recommend heading to the coats & jacket section, where items like the Teddy Coat (now $99), Suede Moto Jacket (now $175, stunning in teal), Buffalo Check Coat (now $99), Velvet Blazer (now $70), Sherpa Denim Trucker Jacket (now $75) and more await you. The Puff Sleeve Leather Jacket (now $150) is a great, feminine take on the leather jacket. MADEWELL | You did read the post, right? 😊 If not, scroll back up and read it!!! Or scroll down for picks. NORDSTROM UPDATED 11/21 | Take up to 60% off in the Black Friday weekend markdown sale. | Is it worth it? For designer deals? Yes. On Monday a Notes perk will be back, but that’s the only kicker to an otherwise already-good promo. | Picks: Three Chloé bags that I love are on sale! Firstly, two I own, the Mini Faye Backpack (now $998 in select colors, on me 1 | 2 | 3) and the Faye Mini Bracelet Bag (now $597, on me). Finally, the Mini Drew Bijoux Leather Shoulder Bag (now $1,307) is on sale and ummm, I think I want it! This cardigan is also really cute. You can check out my recent Nordstrom sale picks here. NORDSTROM RACK ADDED 11/22 | Take an extra 30% off clearance items, for total savings of up to 75% off. | Is it worth it? Oh my goodness yes! If you have the patience to dig through. | Picks: Sizes are extremely limited and go fast in this sale. I recommend heading straight for the boots & booties, where you’ll find goodies like these Kork Ease Mid-Calf booties and short booties, this Klub Nico Chelsea-style boot, and these faux-fur Muk Luks, which are right on-trend. OLD NAVY UPDATED 11/21 | Get 50% off your purchase and a different extra deal each day. No code required; discount reflects in checkout. | Is it worth it? Yup! | Picks: These velvet jeans. Get them! I’ve been quite delighted with this activewear jacket (great for chilly morning runs!) I absolutely love this faux suede skirt — it runs really small if you’re curvy, I take a 14 in it! SHOPBOP | Take up to 25% off your order in the Black Friday Buy More, Save More promo. | Is it worth it? If you’ve had your eye on something and want it before the holidays, yes! No more markdowns til after Christmas. | Picks: Alice + Olivia just so happens to be killing it this season — I love this dress for example! This sequin skirt, OMG. If you don’t own a Pashli satchel yet and want one, this one is already on sale before the promo is applied for less than the classic brown version. WHITE HOUSE BLACK MARKET UPDATED 11/21 | Take 40% off your purchase with code 38515. | Is it worth it? For pricier items yes; I think there will be a 50% off sale closer to Christmas but their pricier items (like leather jackets) may be gone by then. | Picks: I own and love this shell with its very subtle leopard jacquard; if you’re looking for an upscale leather jacket at a great deal this is it; this tweed moto jacket fits like a dream and can be worn as part of a suit. Ohhhh… Roxy, why do you think a better JCrew promo may happen? I thought the 40% off was pretty good and may go for it. I've got 4 full price items in my cart right now. Do you maybe predict a 50% off? LOL – it's such a game. Great Madewell picks! I've got those wide-leg cropped denim jeans and I love 'em! Mostly because J. Crew keeps marking down items so quickly! But you can always PA within 7 days. If you really want the stuff, I say go for it Cynthia. But if you don't mind waiting, then I'd recommend you do. Oh man that would be both awesome and profit-killing for them. Thanks for all the info! Do you foresee Madewell’s leather jacket going on promo before Christmas? Hi Heather, last year it went on sale in late December! After Christmas. Hmm I can't remember exactly, maybe 20% off on sale (so just under $400 before tax)? You have to watch it closely because I do remember that the jacket made it into one of the extra 30% off sale promos and then instantly sold out. If I happen to catch it I'll announce it on the blog since I know people are watching! Yes Roxy a lot of my Black Friday money went to Madewell today! I have had presents sitting in my cart just waiting for the promo! Also got a shirt and sweater for me, I agree with you, their winter offerings I love! Nice Scgirl!! I love it when a promo comes along at just the right moment like this Madewell one has. I actually purchased a few things at madewell last weekend as there was 25% off in store. I debated about the leopard dot sweater and not wish I would have purchased it. I may call and see if they still have it. I purchased the tencel jeans in larkspur (which come in a variety of lengths) and would highly recommend for those looking for a comfortable dark wash jean. For JCREW, I recommend the tuxedo sheath dress. I had to purchase a few new dresses for conferences/meetings (where I have to match business appropriate with cute) and this one sits at the top of my list – very flattering. Happy Shopping all. Thanks for the mini review of the Tencel jeans Shari! And wow I hadn't noticed the Tuxedo Sheath Dress at J. Crew previously but it is lovely!! Do you know if Anthropologie is having any deals? thank you for all your information and keeping us up to date!! You are fantastic!!! They totally are. I had a few gifts (a total of 6 items) in my cart at anthro in addition to the one Item I will purchase for myself (the byron lars). Instead I looked at Madewell's offerings and purchased there instead. So they have just lost $300 of my order. Honestly, I spent less at Madewell and like the items probably better so made out well. However, if anthro had a sale starting today, I may have pulled the plug on the order and left it at that. Urban outfitters now has buy one/get one 50 off. Given my purchases I did better with the 20% off but this is still a nice promo. Thank you Roxy! Does anyone know about Anthropologie's Black Friday sale, or continued promotions? I see that they have 25% off sale items now, but I think if they increase to 40% you can't get a price adjustment and if I wait, I think sizes may go. Thanks! I do know what it is but I’m embargoed from sharing. It will be a sitewide/storewide promo. Oh yes I think it is! I'm not trying to come off coy, I just really can't say what it is yet! It’s already up on the app! No worries, I didn't think you were just being "coy' or trying to avoid the topic or anything…I'm sure they keep that info under lock and key from everyone until the time is right, haha. I pulled the trigger on the 30% off though – that's a great discount for full price!! I bit for the Marnie Corduroy Jacket at Anthro this morning. It was marked down today to $68 including the 25% promo. I'm sure it will be cheaper tomorrow/Black Friday but I need a petite in these sort of jackets and I'm pretty sure they will be gone by then. It was orig $158, so I'm good with that. It is a really nice jacket! Yeah I think you ladies are smart because I have a feeling Anthro will PA on Friday. No official word on that though. Oooh! That would certainly be nice! Keep us posted on that! From the 25->> 30 off you mean, on sale stuff? That would be nice! Good point! Anthro is just as mysterious as ever, lol. Any idea if DSW will have a promo? I can’t remember what happened last year! Also hoping athleta does 20% off; I got some great gifts there last year! I think DSW will do a tiered buy more/save more promo. And yes to Athleta!! I’m excited to see what they offer as I’m liking a lot there right now. What are you hoping to get Katie? p.s. Roxy, you didn’t say whether you felt the WHBM promo is worth it—are there better discounts ahead? Athleta should have a promo. They had an earlier one for cardholders this past weekend. Sweet! That's what I like to hear. They might offer other discounts closer to the weekend though. Just got an email from Free People about a Black Friday pre-shop – 50 items at 50% off plus free ship on all orders. Hey Anthropolitan! The Cassia Wood Watch you mentioned is part of the Free People 50% off promo! *Maybe* you can get a PA? Has anyone seen the faux red leather skirt in person? I like it and just read a negative review about a cheap zipper – boo! There seems to be plenty of this item in stock so I'm on the fence about buying now, or waiting for a sale. I have seen it and tried it on. I can't say I felt like the zipper was cheap at first zip (ha!) but if it is I would not be surprised — I just wore an Anthro dress for the third time in three years and the zipper busted! I'm so mad about it, but at least that's something that can be easily replaced. Most of the other reviews are positive–but yes, I'm inclined to believe that one reviewer has a valid point. Zippers, which tend to be cheap zippers more often than not, are the absolute worst. (I won't even talk about what I call the Nightmare Dress, but since that was Anthropologie c. 2011, it might not be relevant.) *And* I noticed, when I zoomed in on the relevant close-up picture in the listing, that there seems to be a loose thread at the zipper, the sort that can easily get snagged. Overall, while I'm sort of drawn to this skirt, I think it's one of those situations where I would like to try it on, just for fun, but wouldn't end up putting down money to actually own it. And no, I don't think I shall be taking a five hour road trip (in winter conditions, and over a high mountain pass) to the nearest city with an Anthropologie store for that pleasure. Does Madewell do charge sends? I already did most of my Black Friday shopping at Lucky (it's 50% off), and I think I will be adding WHBM to that list! Happy Thanksgiving Anthropolitan and Nam! And everyone in this lovely community!! Also, at 2 PM we leave for turkey, I'm trying my best to keep up with everything until then but please do feel free to share deals here in the comments if it's not already in the post (or not updated in the post) and I will update when I can!